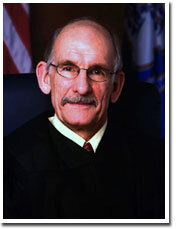 Appellate Court Home Senior Judge Robert E. Beach, Jr.
Judge Robert E. Beach, Jr. was appointed to the Appellate Court on December 10, 2007. Prior to the appointment, he was assigned to the Middlesex Judicial District Courthouse, where he heard Complex Litigation matters. Judge Beach became a senior judge on Dec. 31, 2016. Before taking on his Middletown assignment, he was the Administrative Judge for the Hartford Judicial District. He was nominated to be a judge of the Superior Court by Governor John Rowland and was sworn in in March of 1996. Judge Beach is a graduate of the University of Virginia School of Law, and he received his B.A. from Yale University. Prior to his appointment to the bench, he was a trial lawyer for fifteen years, the latter three with a Manchester firm, of which he was a principal partner. From 1973 to 1981, Judge Beach served as a prosecutor.